Voice of the Customer (VoC) is a strategy to improve the customer experience by incorporating customer feedback into marketing and operations. Implementing a VoC plan can drive a 10x increase in annual revenue. If done correctly, you can also use VoC to bolster your customer retention. One study surveyed over 200 businesses on the trends, solutions, and challenges in customer experience. It found that those using VoC plans to the fullest extent, a.k.a. “Best-in-Class” (BIC) companies, had a year-over-year annual revenue growth by 48.2 percent. In contrast, the other companies in the survey saw a marginally smaller growth of 4.9 percent. The study also found that these BIC groups had a customer retention rate of 87 percent and a 30.4 percent year-over-year change in response time to customer requests. By comparison, other companies in the same survey only showed a 56 percent customer retention rate and a 3.9 percent year-over-year change in response time. How were these BIC companies so successful? To find out, we’ll need to unpack the many sources of customer feedback, analyze it, and then create a template for your VoC strategy. Let’s start with the basics. In truth, there are actually multiple “voices” for the customer, which is great when it comes to gathering data (more on this later). However, don’t limit yourself to these four sources. It’s important that you find as many sources of feedback on your business as possible, and ensure that your team is aware of your findings. With the right plan in place, the pay off can be huge. Coming up with a VoC plan seems intimidating at first, but that couldn’t be farther from the truth. To get the full picture of the current state of your customers, you’ll need to gather solicited and unsolicited feedback. Solicited feedback comes from you asking customers to leave a review on a site or fill out a Net Promoter Score survey. You can also get data from a larger pool of customers by setting up a focus group or conducting interviews. Unsolicited feedback, a.k.a. unstructured data, is information that you didn’t explicitly ask from the customer. Examples include online reviews and social media posts that mention an experience with your service or product. Unsolicited feedback is important because there’s a whole lot of it. IBM reported that 80 percent of all data is unstructured. For brands, that could mean that 80 percent of their data is in the form of customer reviews, social media comments, and mentions. Making sense of unstructured data is confusing at first, but there’s a simple solution. By utilizing text analytics and sentiment analysis, you can find trends and patterns that aren’t obvious at first glance. This includes new ways to improve your brand even if you have a high overall rating, gaining insight into topics or ideas raised by customers, and obtaining a more complete customer profile to help with – you guessed it – the Voice of the Customer. In addition to the data you pull, it’s essential that you respond to customer feedback as soon as possible. Our research shows that most customers expect a response within seven days. 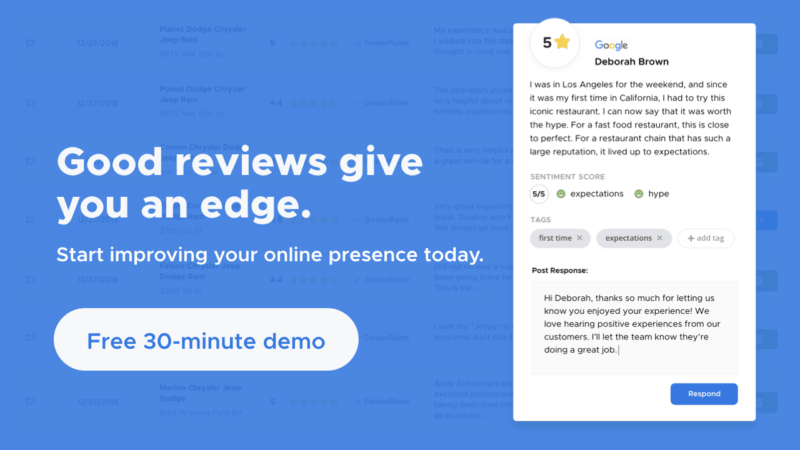 However, our conversations with industry experts show that the response time, especially to a negative review, should be within a 48-hour period. Regardless of when you respond, the important thing is that you engage with your customers. Having a conversation with them shows that you care about your online reputation and their feedback, even if it’s negative. One study showed that responding to negative views can positively change the customer’s perception of a brand. Additional results from the study also showed increased engagement, which led to more review scores and even a rise in overall revenue. After gathering a sufficient amount of data, it’s time to make sense of it. Whether you’re working alone or as a part of a team, you will need to come up with a standard to measure it. Some examples include review sentiments, textual analysis, and trending topics. These features are available on specialized software platforms like ReviewTrackers. In addition to finding the Voice of the Customer, the data can also show positive and negative trends. This is especially helpful for marketing teams who can use the data to create effective campaigns. These same trends can also show you opportunities or pain points that would otherwise be invisible to most people in the company. One company that utilized VoC to its advantage was Netflix, which initially dealt with DVDs. Movies were extremely popular on the early Netflix model, but the company only held the distribution rights for specific films for a short time (about 12 to 18 months), which frustrated customers. To solve the problem, the company “syndicated” hour-long TV shows, such as AMC’s “Mad Men,” which just finished its fourth season at the time of the deal. Soon after, “Breaking Bad” was on Netflix. The company then made original shows like “House of Cards” and “Orange is the New Black.” Binge-watching was born, and it was because Netflix listened to its customers. With all the data and analysis done, you’re ready to create a custom, on-brand VoC plan that meets the needs of your customers. Part of this step might also require you to change or even eliminate old methods to accommodate for the new strategy. However, it’s not enough to just create a plan and execute it. You’ll also need to monitor its effects on a regular basis. Some software platforms allow you to create custom reports that inform company leadership of its effects on a daily, weekly, or even monthly basis. It’s also important to conduct recurring meetings with your marketing and operations departments. This allows you to keep a pulse on the effects of your VoC plan across different parts of your business, and make any necessary changes to the plan. Congratulations! You now know how to create a VoC-based strategy. Before you head out and gather data, you should be aware of some important characteristics that make VoC programs stand out from other business strategies. Scale: For VoC programs, more data is better. Gone are the days when there were limits to the number of customers and feedback sampled for a data spread. Now, it’s more important than ever to listen to every customer whether they left a glowing review or scathing feedback. Insight: At first, showing off the vast amount of collected data might seem impressive. However, it’s better to show your findings in a way that is simple to understand, which in turn makes it easier for the decision-makers to propose and take action. Time: Just like responding to customer feedback, it’s also important to implement your VoC plan in a timely manner. It’s not worth executing on a strategy based on data collected in the past few months or years. By keeping a pulse on feedback, you can quickly respond to customer complaints and demands. Engagement: Make sure you implement a VoC strategy that keeps the entire company engaged. This gives each department – customer success, marketing, sales, operations, etc. – a stake in the strategy, which means a more focused effort in improving the customer experience. By gathering enough data, recognizing trends through analysis, and executing a strategy based on your findings, you can use VoC to improve your business. Other companies used it successfully and retained customers while increasing their revenue tenfold. The Voice of the Customer is everywhere, and it’s time for you to listen and act on it.